Can an office building, workplace, or cityscape have an impact on how we feel — both mentally and physically? In her fascinating 2017 book, Welcome to Your World: How the Built Environment Shapes Our Lives, architecture critic Sarah Williams Goldhagen takes an in-depth look at the emerging science of architecture and reveals that boring buildings aren’t just an eyesore; being exposed to generic and monotone environments day after day can lead to boredom, unhappiness, and even physical distress. On the other hand, environments that are rich with texture, nods to nature, and surprising and irregular forms can inspire learning, thinking, and even healing. Studies have shown, for example, that patients heal faster and require less pain medication when they view nature through a hospital window, while the rate of learning among students has been shown to increase in a single year by as much as 16% in a well-designed school. The implications for workplace and office design are significant. However, traditional office buildings have yet to seize on this research, still placing efficiency ahead of inspiration and utilizing hard, static materials that favor permanence and stability rather than engagement and exhilaration. Such environments don’t feel alive to the modern employee. In today’s digital world, when someone walks into a store they expect dynamic, interactive experiences that immerse them fully in the brand. Why should their expectations be any different for the workplace? Fortunately, things are changing for the better. Sweeping advances in display and mobile technologies are making it possible — and more affordable than ever before — to design and create workplaces, office buildings, and corporate campuses that offer dynamic, interactive experiences that make people want to come to work every day. Such environments allow companies to connect and engage with employees like never before, while also enhancing their overall wellbeing. Most importantly, if carefully curated and customized for the rhythm and tempo of the physical space, flexible and easily updatable digital displays and media give employees a sense of a fresh and evolving workspace. As an added bonus, workplaces that make the most of dynamic technology are not only more interesting for employees – they are more effective at attracting and retaining talent. These workplaces create a first impression that characterizes the space as vibrant and modern, while also conveying the company’s vision and identity in a way that’s enthralling and immediate to potential new employees. Visualizing a company’s data is an effective and smart way to provide employees with a way to see exactly how their own work fits into a business’s broader mission and goals. This can deliver a tremendous boost to morale and transform the workforce into a connected, empowered community. Digital displays and media powered by real-time data are also constantly changing and refreshing, offering employees an ongoing opportunity to engage with their company in new and compelling ways. At eBay’s Silicon Valley campus, a vibrant 20,000-square-foot hub called Main Street showcases a 15-foot touchscreen wall that allows users to explore eBay’s most recent transactions. Other digital installations present the company’s immense wellspring of data as relevant, dynamic and digestible, such as the site’s 10 most popular search terms at a given moment. By translating numbers into content and statistics into stories, Main Street immerses eBay employees in a rich, comprehensible story about the company’s vast community of users and the enormous volume of products sold through its system every day. It shows them how people use the tools they build and how the work they do affects real people’s lives, while also reminding them that the world’s largest online marketplace isn’t just about sales – it’s about giving people, real people, what they truly want. It’s also a way for the corporate communications team at eBay to keep these displays fresh and current without much manual up keep. By designing interactive experiences driven by generative data, the story is always told in real time. Main Street, for example, taps into eBay’s transactional data and finds new stories to share about company’s vast community of users and the enormous volume of products. Another important step for creating an exciting and engaging workspace is to put priority on designing for those who will use and work in the space every day. Main Street is first and foremost a people-centric experience while underscoring the company’s theme of community by providing spaces that foster interaction The hub’s Main hall features an enormous multi-screen for live presentations and company-wide town hall meetings, while smaller spaces – from a coffee bar and an outside deck for meeting breaks to an exterior patio for lunches and informal meetings – offer appealing backdrops for impromptu gatherings. At its headquarters nearby in Sunnyvale, CA, LinkedIn drew on engaging, interactive wall art not only to encourage interaction among its staff, but also to project its values in a way that resonates more deeply than slogans or company logos. Employees can spin a whimsical “Wheel of Dream Jobs” to pair fantasy careers and locations such as travel writer in outer space, or use a camera to photograph themselves against a wall painting of Phoenix wings. Designs that incorporate outdoor imagery unique to the buildings location can offer and provide a sense of expansiveness and foster a bond with the local community. The atrium of Denver’s iconic Wells Fargo Center, designed by Philip Johnson in the early 1980s, features five 86’ tall floor-to-ceiling LED columns that act as a digital window to the landscape beyond, displaying dynamic media inspired by the Mile High City’s natural wonders. In New York City, 575 Fifth Avenue’s lobby showcases screens that wrap around walls and columns, allowing tenants and visitors to “see” through the walls to the bustling Midtown neighborhood beyond. Both designs focus on a key element of the community that is important to the lives of the people working in the space, giving them new perspectives on their environment by connecting them to it in unexpected ways. Since digital media can be easily updated, it can be used to reflect projects, events, and moments in time. 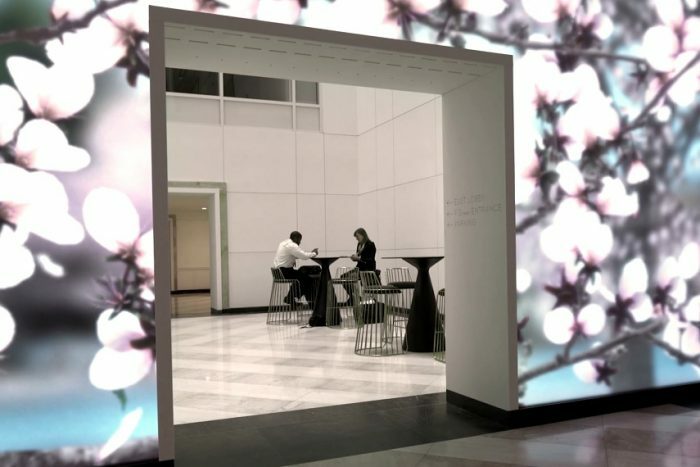 The design at Terrell Place in Washington D.C. can take advantage of this flexibility by presenting dynamic images, such as the iconic cherry blossoms, that change with the outdoor seasons. Terrell Place takes this one step further using motion sensors; its reactive walls respond to passersby in a soothing, non-intrusive manner, that reflects the ebb and flow of office workers throughout the day. Tenants continually discover new layers of audiovisual details in their favorite scenes, and many have come to enjoy figuring out how the images respond to the time of day or their own motion as they pass by. When you are considering adding “screens in space,” the curation of content on the media displays is one of the most important parts of the process. The media content needs to be thoughtfully designed so that it’s pleasing, relevant to the employees that see it every day, and executed with size, scale and pace in mind. All of this insight works to emphasize the installations impact, and avoids the experience feeling like out-of-home billboard advertising, adding more visual noise to the physical environment. The days of static paintings on the walls and a motionless logo in the lobby are fading into the past as corporations and designers recognize that a company’s physical spaces not only delight and charm but also foster opportunities for people to gather, meet, collaborate, and learn. By capitalizing on new and more affordable technologies and smart design, businesses of all sizes can transform their workplace into a dynamic, experiential environment that attracts employees, creates a better workplace culture, and fosters a more happy and engaged workforce. Emily Webster is a Senior Designer and AV technologist at experience design studio ESI Design, which specializes in transforming places - museums, cultural institutions, corporate campuses, workplaces, malls, stores -- into experiences.